Overall US life expectancy is rising, but US suicide rates are also rising. The Centers for Disease Control and Prevention have recently published some short "Data Briefs" showing the patterns. In terms of age groups, suicide rates are up for all age groups except for those over 75 years of age. By ethnicity, the increases in suicide rates are largely explained by a rise in suicides in the white population. In terms of methods of suicide, the share of suicides by firearms is falling, while the share by suffocation is rising. The breakdown by age group shows that suicide rates have risen among all under-75 age groups, but the highest suicide rates are in the 45-64 age bracket, and that's also where the biggest increases in the suicide rates have occurred. The first figure shows the rates for females; the second for males. The same three authors also wrote "Suicide Rates for Females and Males by Race and Ethnicity: United States, 1999 and 2014." The abbreviation API refers to Asian or Pacific Islanders, and the abbreviation AIAN refers to American Indian or Alaska Native. Of course, a much larger share of the US population is white than in the American Indian/Alaska Native category, so the rise in the suicide rate among whites is the primary driver of the rise in the overall suicide rate. The first figure shows suicide rates for females, and the second for males. Finally, the share of suicides in which a firearm was used remains large, but has declined over time, while the share of suicides involving suffocation has risen. Social scientists go to sleep every night muttering "correlation is not causation." 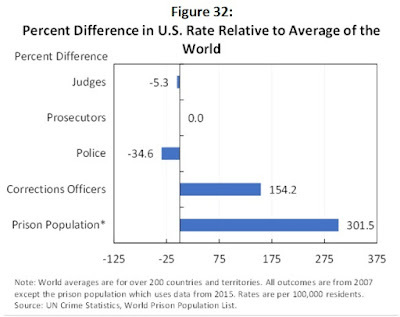 The correlation between rates of crime and rates of incarceration offers a useful example. The Council of Economic Advisers lays out many of the relevant issues in its April 2016 report, "Economic Perspectives on Incarceration and the Criminal Justice System." The report discusses in some detail how levels of police and rates of arrest haven't changed all that much, but the likelihood of arrest leading to a conviction and the length of prison sentence given a conviction are on the rise. There's also some discussion of how the rest of a community is affected by high incarceration rates. 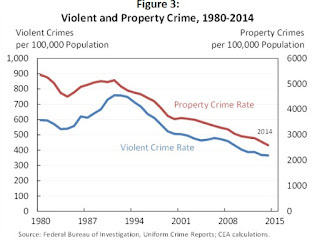 Here, I'll focus on what the report has to say about reducing crime. There's clearly a correlation in the US between a falling rate of crime and a rising rate of incarceration during the last few decades. Using figures from the CEA report, here are the basic patterns. "Researchers who study crime and incarceration believe that the true impact of incarceration on crime reduction is small, with a 10 percent increase in incarceration decreasing crime by just 2 percent or less ... Additional incarceration may be particularly ineffective in reducing crime when incarceration rates are already high. When incarceration rates are high, further incarceration entails incapacitating offenders who are on average lower risk, which means that their incarceration will yield fewer public safety benefits. Thus, given the size of the U.S. incarcerated population, the aggregate crime-reducing impact of increasing incarceration rates is likely to be minimal." "Cost-benefit analyses of incarceration weigh the direct costs of incarcerating an individual against the social value of crimes that may have been averted due to incarceration. Lofstrom and Raphael (2013) examine a 2011 policy change in California that resulted in the realignment of 27,000 State prisoners to county jails or parole. 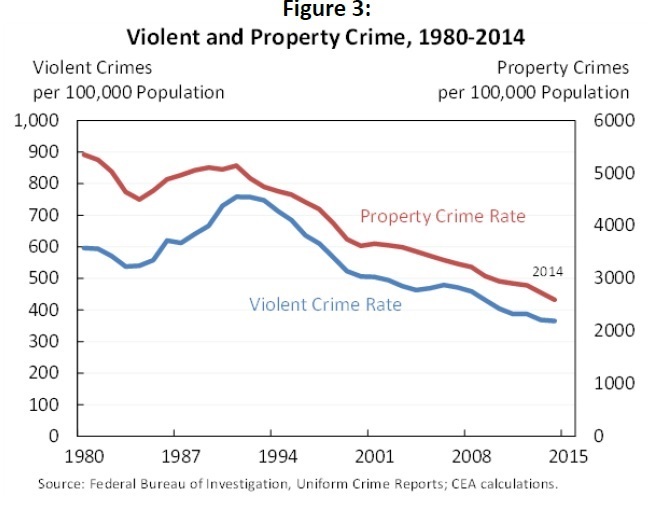 They find that realignment had no impact on violent crime, but that an additional year of incarceration is associated with a decrease of 1 to 2 property crimes, with effects strongest for motor vehicle theft. Applying estimates of the societal cost of crime, the authors calculate that while the cost of a year of incarceration is $51,889 per prisoner in California, the societal value of the corresponding reduction in motor vehicle thefts is only $11,783, yielding a loss of $40,106 per prisoner. Notably, this net loss per prisoner would be larger if the study considered the additional costs of collateral consequences, such as lost earnings or potential increases in re-offending due to incarceration. These estimates highlight the fact that there are more cost-effective ways of reducing crime than incarceration, such as investing in law enforcement, education, and policies that expand economic opportunity." "In contrast to studies of incarceration and sentencing, research shows that investments in police have high returns. In a study of the impact of a mass layoff of highway troopers in Oregon, DeAngelo and Hansen (2014) found that traffic fatalities and non-fatal injuries significantly increased, due to a greater prevalence of dangerous driving and drunk driving. The estimates in this paper suggest that the state trooper salary cost required to save a life is $309,000, which is very low compared to estimates of the statistical value of life, which range from $1 million to $10 million ..."
Indeed, the report offers a striking figure showing some international comparisons on police, judges, corrections officials, and prisoners across countries. 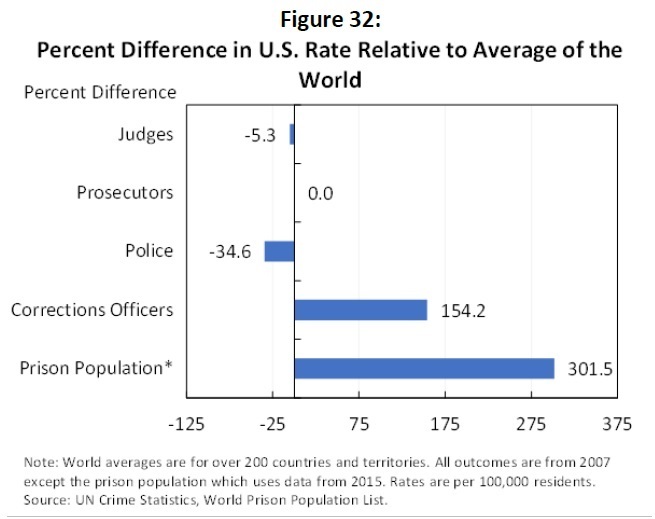 Relative to the size of its population, the US compared to the rest of the world is light on police, but heavy corrections officers and prisoners. At the same time, a $10 billion dollar investment in police hiring would decrease crime by 5 to 16 percent (440,000 to 1.5 million crimes) have a net societal benefit of $4 to $38 billion dollars." "Lochner and Moretti (2004) conduct a cost-benefit analysis of the effect of increasing the high school graduation rate on crime and arrest rates. Comparing costs and benefits in 1990, they estimate that while the yearly per pupil cost of secondary school is $6,000, the societal benefit from reducing crime is $1,170-$2,100 per additional male graduate, including reductions in victim costs, property damages, and incarceration costs. When these benefits are considered alongside an $8,040 increase in annual income from a high school degree, the benefits of an additional high school graduate are tremendous ... In aggregate, the authors calculate that a 1 percent increase in the total high school graduation rate generates a $1.4 billion benefit due to reductions in crime rates." 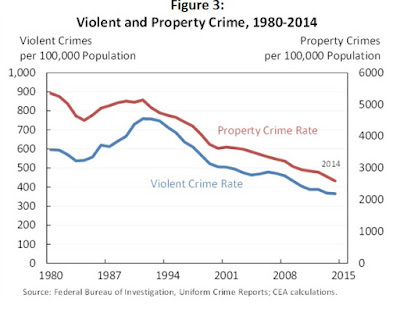 Crime is falling for lots of reasons over the last three decades. 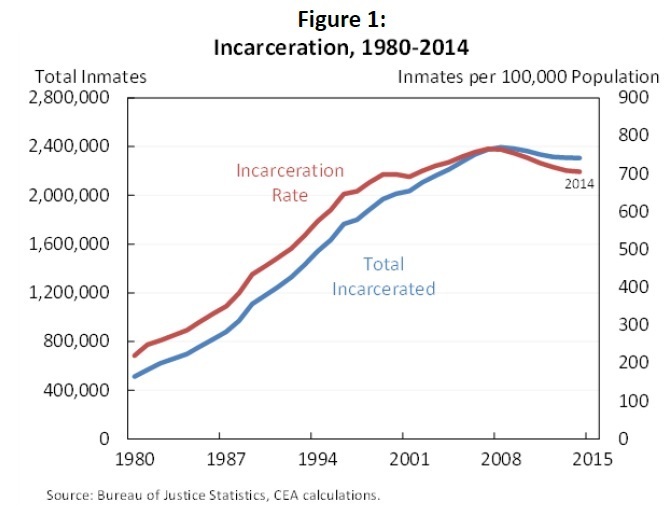 Rising incarceration may well have been a moderate contributor to the fall in crime back in the 1980s, when the incarceration rate was relatively low. But by the 2000s, when the incarceration rate had more than doubled, it had become a costly and not-very-powerful way of reducing crime. From that perspective, it's not a coincidence that California and other states have been scaling back on their incarceration rate in the last few years. As various states are recognizing, there are more cost-effective alternatives to keep the crime rate on a downward trend. Here's a question that the Gallup Poll has been asking Americans every few years since the 1960s, most recently in December 2015 In your opinion, which of the following will be the biggest threat to the country -- big business, big labor, or big government? Not to keep you in suspense: Big government is winning, or perhaps it's more accurate to say losing, this contest. Here are the answers going back to 1965. It makes sense that the share of those listing "big labor" has dropped over time, given the decline in the share of US workers belonging to a union. It's interesting that the share naming big business as the biggest threat is about the same now as in the Carter era of the late 1970s. Sure, there have been some spikes in viewing big business as the biggest threat, like a spike probably related to Enron and other corporate governance scandals in the early 2000s and a spike around 2009 in the aftermath of the corporate and financial bailouts. But there doesn't seem to be an overall trend upward. For big government, on the other hand, there does seem to be a long-term upward trend: that is, given the way the question is phrased, the shift away from seeing "big labor" as the leading issue has been counterbalanced by a swing toward naming "big government" instead. What's the political breakdown here? Here's the share naming big government as the biggest threat, broken down by party. It's no surprise that Republicans are most likely to name big government as the problem and Democrats are least likely, with Independents falling between. It's also perhaps expected that when Barack Obama was elected president in 2008, the share of Democrats naming "big government" as the biggest threat showed a big drop. But historically, it looks as if a little more than half of Democrats see "big government" as the biggest threat through the 1980s and 1990s, and in the December 2015 data as well. Of course, it's worth noting (especially in an election year) that opposition to "big government" might not be a broad philosophical opposition to all big government, but just be disappointment or opposition to the existing government--perhaps along with the evergreen belief that an alternative big government would perform better. What Do We Know about Subsidized Employment Programs? A subsidized employment program is when the government offers a subsidy to an employer (could be private sector or public sector) to hire those from a certain eligible group. The eligible group can be defined in many ways: for example, those who live in a certain set of neighborhoods, or those who have been unemployed for a certain time, or single mothers, or the disabled, or older workers, or those just emerging from jail or prison, or those who are already in some income-support program and trying to make a transition to work, or other groups. The basic idea of subsidized employment is that it's better to pay people to work than it is to support them while they aren't working--and further, there is a hope that subsidized work experience can be a transition to being hired by an employer who doesn't need a subsidy. Indivar Dutta-Gupta, Kali Grant, Matthew Eckel, and Peter Edelman provide a useful overview of the existing research in "Lessons Learned from 40 Years of Subsidized Employment Programs," published by the Georgetown Center on Poverty and Inequality in Spring 2016. The report calls subsidized employment a "promising strategy," which seems a fair judgement if one mentally adds "but not yet proven." There are two major federal government studies now underway involving subsidized employment. The "Subsidized and Transitional Employment Demonstration (STED), 2010-2017" being run by the US Department of Health and Human Services in seven cities and the Enhanced Transitional Jobs Demonstration study is being run in seven cities by the US Department of Labor. Results from these studies should become available over the next couple of years. It's easy to hypothesize about why subsidized employment programs might work, or not, but as we wait for these big new studies to be completed, what does the preexisting evidence say? As one might suspect, the reason that the government is doing the additional studies is that the existing evidence isn't as clear as one might like. For example, one of the biggest subsidized employment programs tried in the US was the Comprehensive Employment Training Act which ran from 1973-1982. It offered a combination of public service jobs, classroom training, subsidized on the job training and work experience. As of 1980, for example, there were more than 700,000 people participating in CETA. But as the report writes, CETA "was not rigorously evaluated." Modern studies are often set up with a big group of eligible participants who are then randomly assigned either to get the subsidized employment or not. Based on this study design, it's relatively straightforward to look at the difference in outcomes between two very similar groups--some of who are randomly in the program and some who are not. But CETA wasn't based on randomization. People decided whether to enroll, and presumably those who had more initiative or responsibility or better skills or fewer life problems were more likely to enroll. Economists tried to use statistical tools to sort out these factors, but while some factors are measureable (say, years of schooling or prior work experience), lots of factors like initiative or sense of responsibility aren't collected in data. So figuring out how much difference CETA made, as opposed to these other characteristics, was very hard. As the report says: "Little can be said with certainty about CETA ... but non-experimental studies suggest sometimes contradictory findings, with one analysis suggesting positive effects only for women in classroom training, OJT [on-the-job training], and public service employment (not work experience), and another analysis of the impacts of training on men found large positive effects from classroom training and smaller, positive effects from OJT." It's also fair to point out that the labor market for lower-skilled labor has evolved considerably during the four decades or since CETA, so even if the evidence was a lot more clear-cut than it is, it seems hazardous to draw lessons for getting people jobs in 2016 based on evidence from the 1970s and early 1980s. Subsidized employment programs have successfully raised earnings and employment. This effect is not universal across programs or target populations, but numerous rigorously evaluated interventions offer clear evidence that subsidized employment programs can achieve positivelabor market outcomes. Some of these effects derive from the compensation and employment provided by the subsidized job itself, but there also is evidence that well-designed programs can improve outcomes in the competitive labor market after a subsidized job has ended. Subsidized employment programs have benefits beyond the labor market. Fundamentally, subsidized jobs and paid work experience programs provide a source of both income and work experience. A number of experimentally-evaluated subsidized employment programs have in turn reduced family public benefit receipt, raised school outcomes among the children of workers, boosted workers’ school completion, lowered criminal justice system involvement among both workers and their children, improved psychological well-being, and reduced longer-term poverty; there may be additional effects for some populations, such as increases in child support payment and improved health, which are being explored through ongoing experiments. Subsidized employment programs can be socially cost-effective. Of the 15 rigorously evaluated (through experimental or quasi-experimental methods) models described in this report, seven have been subject to published cost-benefit analyses. Keeping in mind that more promising and effective models are more likely to lead to such analyses, all seven showed net benefits to society for some intervention sites (for models implemented at multiple sites) and some target populations. Four of these seven models were definitively or likely socially cost-effective overall. Academic researchers are congenitally fond of ending their studies by saying "more research is needed." Isn't it always? But in this case, it seems a fair conclusion--and the good news is that the additional research has been underway for some years already and is fairly close to completion. Until then, this overview by Dutta-Gupta, Grant, Eckel, and Edelman is a solid summary and overview of the existing evidence. Remember that back in 1946, the US economy had just gone through an extraordinary array of stresses and dislocations, including the brutality of the Great Depression from 1929-1933, the steep and severe recession of 1937-38, the disruptions of wartime production, and a post-World War II recession from February to October 1945. 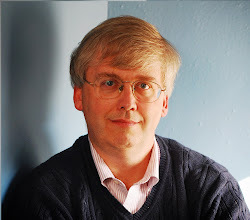 Thus, it's interesting to me that the CEA overview of economic policy sought to strike a balance between two extremes that have remained recognizable in policy discussions ever since, which they named "The Spartan Doctrine of Laissez Faire," which had a somewhat fatalistic review that sometimes bad stuff just happens in the economy, and "The Roman Doctrine of an External Remedy," which held that well-conceived government action could pretty much always prevent bad economic outcomes. Here's how the 1946 report described the two views. In discussing these polar extremes, the CEA report tried to stake out a middle ground, saying that "it is with the 100-percenters or the 90-percenters that we disagree." "In contrast to the Spartan business theory and practice that carried a cult of individual self-reliance to the point of brutality and needless waste, we believe it is not fanciful to liken this doctrine of an overall offset to managerial maladjustment to the Roman system that swung to an extreme opposite to that of Sparta. Roman citizens were—for a time— relieved of the compulsion of relying on their own efforts to keep their economy as a desirable level. "Bread and circuses" were provided for all through the power of the state. Similarly, this theory relieves businessmen of the necessity of themselves making the business adjustments by which they would keep the system going at a satisfactory level. As we found in the Spartan school of thought, it is with the 100-percenters or perhaps the 90-percenters that we disagree. Extremists of the Roman doctrine says that we need not worry about any maladjustments in our enterprise system. Monopolistic price policies may curtail markets and cause unemployment. Excessive wage demands may drive costs up and paralyze profits, investments, and employment. We do not need to worry because we can always create full employment by pumping enough purchasing power into the system. If there is too much demand for labor and materials—that is inflation—we turn the faucet off and cause a contraction. Thus by manipulation of Government expenditures and taxation, continuing full employment is assured, and we do not need to worry about anything else in the economy. "For the actual operation of the major forms of business, we need the intimately informed and flexible decision making of private individuals in their business relations and of executives of business organizations. But we must recognize also that the practically sound and individually efficient management of private farming, manufacturing, transportation, distribution, and banking in the practical situations in which the active managers must make their decisions will not, year in and year out, add up to a sustained and satisfactorily stabilized total utilization of the Nation's resources in producing the national well-being of which we are in fact capable. Hence experience and experimentation teach us that there is an important area of Government action in stimulating, facilitating, and complementing the enterprise of private business even if individually well managed. This functional differentiation and cooperation between private enterprise and public enterprise is in our view something quite different from and much better suited to our situation and temperament than the nationalization of industries to which our English cousins have now resorted. Nor does it involve that regulation of actual business operation which would constitute bureaucratic "regimentation." We believe, therefore, that when the Congress instructed the Council of Economic Advisers to set up consultative relations "with such representatives of industry, agriculture, labor, and consumers, State and local governments, and other groups as it deems advisable," this outlines one of the major features of our work and one of the most important ways in which we may prove of aid in creating and maintaining conditions of maximum employment and the high standards of living that go with it. By consulting with the most thoughtful and responsible leaders of these groups with reference to conditions which would promote the welfare of the country as a whole, we believe that our counsel and advice on the national economic program will reflect a realistic grasp of the needs and difficulties of the several factors in the total economic process. We trust also that in the course of these consultations we may reflect back to the leaders of these groups something of the demands that successful operation of a total system make upon each of its component parts. In particular, we trust that we may translate objectively to the representatives of the various business, labor, and agricultural groups the purposes and methodology of the Government programs so that, instead of blind opposition which might arise through misunderstanding, there may always be constructive criticism, which will lead to useful adaptation. As financial globalization proceeded, U.S. investors concentrated their foreign holdings in risky and/or illiquid securities such as portfolio equity or direct investment, while foreign investors concentrated their U.S. asset purchases in portfolio debt, especially Treasuries and bonds issued by government-affiliated agencies in areas such as housing finance, and cross-border loans. Here's a figure illustrating the pattern, with net debts owed from the US economy to the rest of the world at the bottom, and net portfolio equity and foreign direct investment by US investors in the rest of the world on top. Why does this matter? Here are a few of the consequences as Gourichas lays them out. 1) Essentially, the US economy has been able to borrow cheaply from the rest of the world, and then invest those funds in companies around the world. The average return on equity over sustained periods of time is higher than the return on debt. Gourinchas cites estimates that the gap has been between 2.0 and 3.8% per year since 1973. 2) "These large and growing U.S. excess returns have first-order implications for the sustainability of U.S. trade deficits and the interpretation of current account deficits. As an illustration of the orders of magnitude involved, suppose that the U.S. has a balanced net international investment position with gross assets and liabilities of 100 percent of GDP. An excess return of 2 percent per annum implies that, on average, the U.S. can run an annual trade deficit of 2 percent of GDP while leaving its net international investment position unchanged. More generally, since a large part of realized returns take the form of valuation gains due to changes in asset prices and exchange rates, the current account, which excludes non-produced income such as capital gains, will provide an increasingly distorted picture of the change in a country's external position." 3) "[A] deterioration of the U.S. trade balance or of its net international investment position is often followed by a predictable depreciation of the U.S. dollar against other currencies. This depreciation may subsequently improve the U.S. trade balance along the usual channels, but it also improves the return on U.S. financial assets held abroad, thereby making the U.S. relatively richer.Most other countries don't seem to enjoy a similar advantage." 4) Why has this pattern of "foreigners buy US debt, US investors buy foreign equity" emerged? Gourinchas argues that a main reason is that "it reflects a superior capacity of the U.S. to supply `safe' assets—assets that will deliver stable returns even in global downturns." 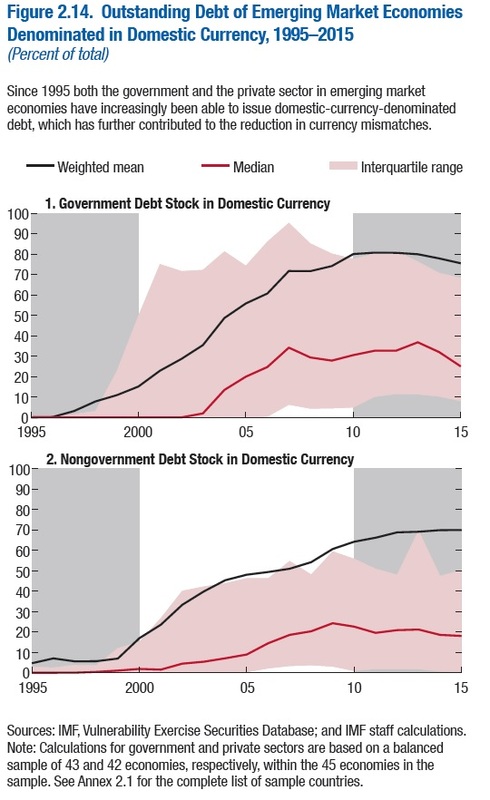 As a result, the US economy can depend on an inflow of debt financing at low interest rates. On the other side, "[w]illingly or not, global suppliers of safe-haven assets must bear more exposure to global risks." When a global recession occurs as in 2008, US-based investors will tend to bear heavier losses because they are more exposed to equity risks everywhere in the world. "Lower funding costs come with a commensurate increase in the global exposure of their external balance sheet." 5) Finally, the US economy probably can't keep playing the role of providing such a disproportionately large share of safe assets for the entire global economy. Gourinchas argues: As the world economy grows faster than that of the U.S., so does the global demand for safe assets relative to their supply. This depresses global interest rates and could push the global economy into a persistent ZLB [zero lower bound] environment, a form of secular stagnation. ... Finally, a body of empirical evidence suggests that environments with low interest rates may fuel leverage boom and bust cycles. The vulnerability of emerging and advanced economies alike to these crises has been amply demonstrated in the past." For a few decades now, "foreigners buy US debt, US investors buy foreign equity" has been a reasonable equilibrium in the global financial system and a benefit to the US economy But in years ahead, it may well become a cause of stress. The number of Mexicans apprehended at the US border is approaching a 50-year low, dropping back to levels last seen in the 1960s. Most of the reason seems to be that immigration from Mexico dropped off several years ago, and has stayed low since then. Ana Gonzales-Barrera gives a quick overview of the evidence in "Apprehensions of Mexican migrants at U.S. borders reach near-historic low," published on April 14 by the Pew Research Center. Here's the annual data from the US Border Patrol on apprehensions at the US-Mexico border over time. The number of border apprehensions is often taken as a rough-and-ready measure of the number of people seeking to enter the US illegally. The decline strongly suggests that fewer Mexicans are trying to do so. Here's data from the Mexican government on the emigration rate from Mexico per 100,000 in the last decade. 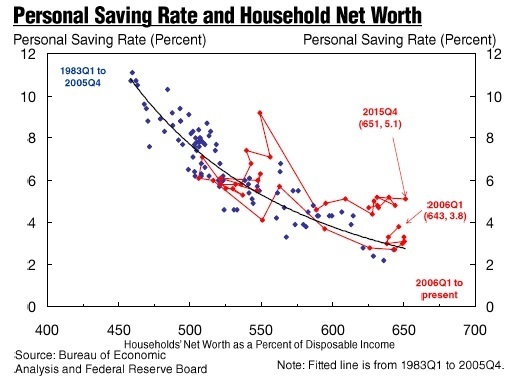 Notice that the big decline happens some years ago, even before the start of the Great Recession. Data from the US side of the border on the Mexican immigrant population in the US actually shows a downturn in recent years. Gonzalez-Barrera provided a useful figure in a longer report she wrote last fall at the Pew website about "More Mexicans Leaving than Coming to the U.S." (November 19, 2015). These trends and the economic and demographic patterns behind them aren't new. I was blogging four years ago on the topic: "Net Immigration from Mexico Stops--or Turns Negative" (April 24, 2012). I wrote last year about "The Declining Number of Illegal Immigrants" (July 13, 2015) and about how "China and India Overtake Mexico for Inflow of US Foreign-Born Residents" (May 13, 2015). How to limit or regulate the enormous inflow of immigrants from Mexico was a legitimate policy concern from the 1970s into the early 2000s. As Gonzalez-Barrera puts it, that migration was "one of the largest mass migrations in modern history." But now that flow has fallen substantially, and even reversed itself. The main issue now is be how we deal with the after-effects of that enormous mass migration and the immigrants who are already here--many of whom have been here for quite some time. In a "noncompete contract," an employee signs a contract with an employer not to work for a competing firm for some period of time. The usual justification for such agreements is that it would be unfair an employee who has detailed knowledge of trade secrets or customer contracts to take that information to a competitor. miles of any of the 2,000 Jimmy John's restaurants anywhere in the country. The Office of Economic Policy at the U.S. Department of the Treasury has published a useful overview of these issues in its March 2016 report: "Non-compete Contracts: Economic Effects and Policy Implications." Non-compete agreements are contracts between workers and firms that delay employees’ ability to work for competing firms. Employers use these agreements for a variety of reasons: they can protect trade secrets, reduce labor turnover, impose costs on competing firms, and improve employer leverage in future negotiations with workers. However, many of these benefits come at the expense of workers and the broader economy. Recent research suggests that a considerable number of American workers (18 percent of all workers, or nearly 30 million people) are covered by non-compete agreements. The prevalence of such agreements raises important questions about how they affect worker welfare, job mobility, business dynamics, and economic growth more generally. This report presents insights from economic theory and evidence on the economic effects of non-compete agreements. It goes on to discuss policy implications, starting a discussion about how such agreements could be used in a way that balances the interests of firms with those of workers and society as a whole. fThe conventional picture of a workplace characterized by non-compete agreements is one that features trade secrets, including sophisticated technical information and business practices that firms have a strong interest in protecting. By preventing a worker from taking such secrets to a firm’s competitors, the non-compete essentially solves a “hold-up” problem: ex ante, both worker and firm have an interest in sharing vital information, as this raises the worker’s productivity. But ex post, the worker has an incentive to threaten the firm with divulgence of the information, raising his or her compensation by some amount equal to or less than the firm’s valuation of the information. Predicting this state of affairs, the firm is unwilling to share the information in the first place unless it has some legal recourse like a non-compete contract. Moreover, a noncompete can be a way for firms to seek out employees who intend to remain with the firm for a time. When the firm that knows its workers will not be decamping for the competitor down the street, it finds it easier to share trade secrets and company methods across all workers in the firm, and to provide training in these methods as needed. • Non-competes are common among workers who report lower rates of trade secret possession: 15 percent of workers without a four-year college degree are subject to non-competes, and 14 percent of workers earning less than $40,000 have non-competes. This is true even though workers without four-year degrees are half as likely to possess trade secrets as those with four-year degrees, and workers earning less than $40,000 possess trade secrets at less than half the rate of their higher-earning counterparts. • Available evidence suggests that workers with a low initial desire to switch jobs are not more likely to match with employers who require non-competes. • In some cases, non-competes prevent workers from finding new employment even after being fired without cause; in such cases, it is difficult to believe that non-competes yield social benefits. Noncompete contracts often include provisions that are not enforceable under state law: for example, state law in California makes noncompete contracts (with a few limited exceptions) essentially unenforceable, but 19% of California workers sign such agreements. Noncompete contracts are often presented to workers as part of the paperwork that they need to sign when showing up for their first day on the job, which doesn't suggest that they are part of a negotiation between employer and prospective employee about access to trade secrets and future training. There's even some evidence (which at this stage I would characterize as "real, but weak") that signing a noncompete causes less future job mobility and even lower future wages on average. There's also an interesting big-picture story looming here. Histories of the development of Silicon Valley in its early years have often talked about the extremely fluid employment culture. The legends say that an engineer could have a tiff with the boss one morning, walk out the front door of the company and across the street to a competing firm, be hired, and be working for the other firm that same day after lunch. The point is that while California companies might have preferred to have noncompete contracts, these were not enforceable in California. As a result, engineers to come work in California, and the flow of workers between companies encouraged the flow of ideas and innovation, while also encouraging companies to offer high compensation and an attractive work environment. However, the US Treasury report is quite mild-mannered in drawing policy conclusions, my own reading of the evidence is that noncompete contracts are often overused. The law of labor contracts is largely determined at a state level (whether by legislation or by case law), so if I was in state government, I would be thinking seriously about writing laws that place limits on noncompete contracts. Some states, following the example of California, might prefer the clean sweep approach and come close to outlawing contracts with only a few exceptions. (Of course, rules about stealing trade secrets would still apply.) Other states might prefer more incremental reforms. Some firms already provide severance payments to workers with non-competes. For instance, a worker who quits may receive 50 percent of her previous salary in exchange for abiding by the terms of the non-compete. This limits the harm to workers while ensuring that firms retain the ability to protect their interests with non-competes. Importantly, by requiring that firms incur a cost when requesting a non-compete, this policy preserves the most socially valuable non-compete agreements and discourages the least valuable, for which firms would not be willing to pay. As another example, states could require that noncompete contracts cannot delay someone taking a job with a competitor for more than a certain period: for example, Oregon recently passed a law limiting noncompetes to 18 months. Or states could pass laws that noncompete contracts won't apply to anyone in a job paying less than $15-$20 per hour, or that they won't apply to workers in certain industries. Or states could pass a law that firms can only put language in a contract which is enforceable under the law of the state, to avoid the California-style scenario where 19% of workers are signing contracts that they often do not know are unenforceable. The presumption in a market-oriented economy should be that workers are free to switch between jobs when they wish to do so. Employers who want to keep employees have many tools to do so, including paying bonuses related to length of time on the job. Noncompete contracts may occasionally make sense, but they should be a great deal more rare than they currently are. Hat tips: For some other commentary on the US Treasury noncompete report, see the post by Nick Bunker at the Washington Center for Equitable Growth website, and the article by Justin Fox at the Bloomberg View website. U.S. tax returns and taxes owed for 2015 are due today, April 18. To commemorate, I offer some connections to five posts about taxes from the last few years. Click on the links if you'd like additional discussion and sources for of any of these topics. 2) Could government just fill out preliminary and placeholder tax returns for everyone? For most people, the US government already has access to your income earned at work, through records from your employer, and it has access to the pathetic little slice of interest you are earning on your bank account. Your age, and the ages of your family members, advance predictably from year to year. For those who don't itemize deductions on their tax returns, which is about 70% of all tax returns, this is all the information needed to fill out your taxes. So why doesn't the US government fill in this information, calculate taxes owed or refund to be received, and send it to you? You could just accept what they sent, or you could file as usual and make any needed corrections. I discuss how this is done in Denmark, where about 80% of taxpayers accept the accuracy of the form the government sends them, and I also discuss the hurdles faced by proposals to do this in the United States, in "When Government Pre-Fills Income Tax Returns" (April 15, 2014). 3) What is the average share of income paid in federal taxes by people from different income groups? 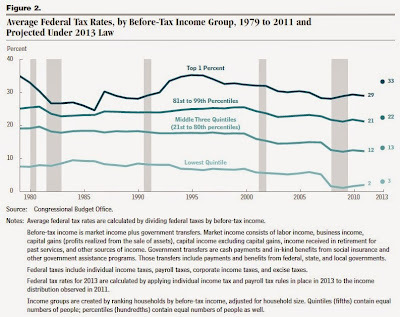 However much and in whatever direction your knee-jerk reflexes twitch when the subject of income distribution arises, it's useful to start with a grounding of "Facts on the US Income Distribution, Before and After Taxes" (November 14, 2014). The Congressional Budget Office lays out many of the key facts in a November 2014 report: "The Distribution of Household Income and Federal Taxes, 2011." 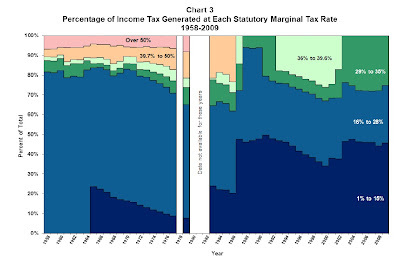 As one example among several discussed at the post and in the report, here's the path of average taxes paid as a share of income over time that includes all federal taxes: that is, federal income taxes, payroll taxes, corporate income taxes (attributed back to individuals). and excise taxes. The division here is top 1%, 81st-99th percentile, middle three quintiles (that is, middle three-fifths), and bottom quintile. Again, these are average tax rates. 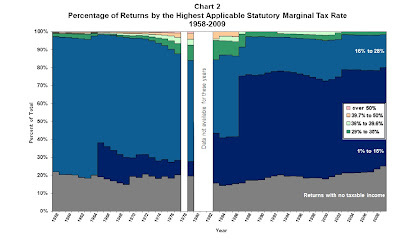 Thus, a person at the very top of the income distribution might well be paying a tax rate on the marginal dollar of market income received of 40% or more, but the average tax rate for that same person over all income received could well by the 29% shown for 2011 in the figure. It feels as if the tradeoffs involved in anti-drug policies are now up for discussion, in a way that they weren't 20 or 30 years ago. One signal is that the United Nations convened a special session about drugs back in 1998, with an underling theme of of prohibitionism. Next week, the UN will convene another special session about drugs, and the tone may sound rather different. For a sense of how the argument is evolving, a useful starting point is "Public health and international drug policy" from the Johns Hopkins-Lance Commission on Drug Policy and Health, published at the website of the Lancet on March 24, 2016. "The Johns Hopkins–Lancet Commission, cochaired by Professor Adeeba Kamarulzaman of the University of Malaya and Professor Michel Kazatchkine, the UN Special Envoy for HIV/AIDS in Eastern Europe and Central Asia, is composed of 22 experts from a wide range of disciplines and professions in low-income, middle-income, and high-income countries." The previous UN General Assembly Special Session (UNGASS) on drugs in 1998—convened under the theme, “A drug-free world—we can do it!”—endorsed drug-control policies with the goal of prohibiting all use, possession, production, and trafficking of illicit drugs. This goal is enshrined in national laws in many countries. In pronouncing drugs a “grave threat to the health and wellbeing of all mankind”, the 1998 UNGASS echoed the foundational 1961 convention of the international drug-control regime, which justified eliminating the “evil” of drugs in the name of “the health and welfare of mankind”. But neither of these international agreements refers to the ways in which pursuing drug prohibition might affect public health. The war on drugs and zero-tolerance policies that grew out of the prohibitionist consensus are now being challenged on multiple fronts, including their health, human rights, and development impact. ... The disconnect between drug-control policy and health outcomes is no longer tenable or credible. The basic message here is simple enough: the goal of anti-drug policy is to improve public health. Thus, when evaluating anti-drug policy, it is reasonable to take into effect both how effective it is in reducing drug us and improving health, but also how the enforcement effort itself may be adversely affecting health health. Murders by drug cartels as one of the more obvious examples, but the Commission quotes a provocative comment from "former UN Secretary-General Kofi Annan, `Drugs have destroyed many people, but wrong policies have destroyed many more'." Here are some of the tradeoffs of anti-drug policy as laid out by the Johns Hopkins-Lancet Commission. As a starting point, the gains from existing prohibitionist policies typically need to be phrased in terms of "well, maybe they discouraged drug use from getting a lot bigger," because it's hard to demonstrate that drug use has been falling in more than a modest way. In 1998, when the UN members states declared their commitment to a drug-free world, the UN estimated that 8 million people had used heroin in the previous year worldwide, about 13 million had used cocaine, about 30 million had used amphetamine-type substances (ATS), and more than 135 million were “abusers”—that is, users—of cannabis. When countries came together after 10 years to review progress towards a drug-free world in 2008, the UN estimated that 12 million people used heroin, 16 million used cocaine, almost 34 million used ATS, and over 165 million used cannabis in the previous year. The worldwide area used for opium poppy cultivation was estimated at about 238 000 hectares in 1998 and 235 700 hectares in 2008—a small decline. Prohibition as a policy had clearly failed. ... North America continues to have by far the highest rates of drug consumption and drug-related death and morbidity of any region in the world, and drug policy in this region tends to influence global debates heavily. Between 2002 and 2013, heroin-related overdose deaths quadrupled in the USA, and deaths associated with prescription opioid overdose quadrupled from 1999 to 2010. One of the most obvious tradeoffs of anti-drug policy has been gang violence. It's hard to measure this in any precise way, but the report cites evidence that in the Americas, about 30% of all homicides involve criminal groups and gangs, compared with about 1% in Europe or Asia. In Mexico, the rise in homicide rates after 2006 has been so extreme--from a national rate of 11 per 100,000 to a rate of over 80 per 100,000 in the most heavily affected locations--that it actually reduced average life expectancies for the entire country. Of course, just looking at murders leave out other violence, including sexual assault. About 2% of Mexico's population is displaced from their homes by violence and risk of more violence. Colombia, Guatemala, and others have experienced a sharp rise in violence as well. Much of this is drug-related. The illegality of drug use means that those who inject illegal drugs are likely to share needles, which in turn raises the rates of infection for HIV, hepatitis, tuberculosis, and other illnesses. One estimate is that outside Africa, 30% of cases of HIV infection are caused by unsafe drug injections. "A landmark US study showed that over half of people who inject drugs were infected with HCV during their first year of injecting." Drug overdose should be an urgent priority in drug policy and harm-reduction efforts. Overdose can be immediately lethal and can also leave people with debilitating morbidity and injury, including from cerebral hypoxia. ... In 2014, WHO estimated that about 69 000 people worldwide died annually from opioid overdose, but that estimate might ot have captured the substantial increase in opioid overdose deaths especially in North America since 2010. In the EU, drug overdoses account for 3·4% of deaths among people aged 15–39 years. drug crimes make up about 21% of incarcerated people worldwide. Possession of drugs for individual use was the most frequently reported crime globally. ... [D]rug-possession offences constituted 83% of drug offences reported worldwide." The evidence that incarceration for possession or use of drugs deters use in any substantial way is weak. 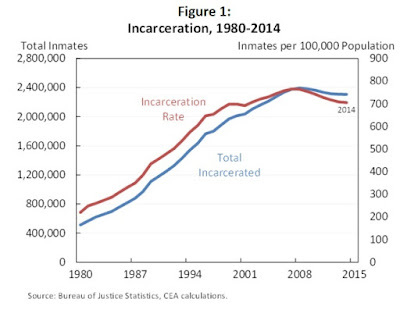 But incarceration does tend to reinforce other social inequalities: in the US, for example, African-Americans are disproportionately affects by drug-related incarceration. In many cases, young people and women who are low-level carriers of drugs end up with significant sentences. Prison is of course a place where additional drug use and violence are common. Those who aren't in any way involved personally in the drug business, but who live in communities where the rates of incarceration are high, find themselves bearing high costs, too. When it comes to drugs, most of us are not pure prohibitionists at heart. We regularly consume caffeine through the workday, and occasionally alcohol after the workday. Maybe we don't use nicotine ourselves, but we don't see a compelling reason why our friends who like a nicotine hit now and again should be locked up. A growing number of Americans live in states--Washington, Colorado, Oregon, and Alaska--where recreational use of marijuana is legal. Some countries like Uruguay are experimenting with legalization of marijuana, as well. On the other side, most of us are not pure libertarians when it comes to drugs, either. Rules about age limits, time and place of use, and intoxication while driving or just walking down the street can make some sense. A country which gives serious considering to limiting the size and availability of sugared soft drinks is unlikely to take a hands-off attitude to drug use. Decriminalise minor, non-violent drug offences— use, possession, and petty sale—and strengthen health and social-sector alternatives to criminal sanctions. Reduce the violence and other harms of drug policing, including phasing out the use of military forces in drug policing, better targeting of policing on the most violent armed criminals, allowing possession of syringes, not targeting harm-reduction services to boost arrest totals, and eliminating racial and ethnic discrimination in policing. Although regulated legal drug markets are not politically possible in the short term in some places, the harms of criminal markets and other consequences of prohibition catalogued in this Commission will probably lead more countries (and more US states) to move gradually in that direction—a direction we endorse. Hat tip: I ran across a mention of the Johns Hopkins-Lancet Commission on Drug Policy and Health in a post by Emily Skarbek at the Econlog website. There's a widespread sense that fewer American jobs involve an ongoing connection to a employer, and a larger share are in some sense temporary or on-call. "Gig economy" jobs with companies like Uber are the most prominent recent example of this concern, but while the issue seems potentially much broader, hard data is lacking. The US Bureau of Labor Statistics has sometimes conducted a Contingent Worker Survey, but for budgetary reasons, that survey hasn't been conducted since 2005. The Secretary of the US Department of Labor, Thomas Perez, announced a few ago that the the survey would be done again in May 2017. But in the meantime, efforts to spell out "How Many in the Gig Economy?" (February 16, 2016) have typically used a wide variety of definitions and partial data sources, making it hard to reach clear conclusions. Lawrence F. Katz and Alan B. Krueger took on this challenge head-on. The RAND Corp. conducts research using an American Life Panel, "a nationally representative, probability-based panel of over 6000 members ages 18 and older." Katz and Krueger contracted with RAND to include a set of questions about contingent workers in the October-November 2015 American Life Panel Survey. The questions were based on those used in 1995 and 2005 by the US Bureau of Labor Statistics. The first round of results from this research apppear in a working paper, "The Rise and Nature of Alternative Work Arrangements in the United States, 1995-2015," which was published online on March 29, 2016.
is particularly noteworthy given that the BLS CWS showed hardly any change in the percent of workers engaged in alternative work arrangements from 1995 to 2005. We further find that about 0.5 percent of workers indicate that they are working through an online intermediary, such as Uber or Task Rabbit ... Thus, the online gig workforce is relatively small compared to other forms of alternative work arrangements, although it is growing very rapidly. ... The General Accounting Office (2015) analyzes data from the General Social Survey and CWS and finds that an expansive definition of alternative work arrangements, which includes part-time employees, increased from 35.3 to 40.4 percent of employment from 2006 to 2010." Future work on this data will dig into details about wages, total earnings, and work hours for these alternative workers. But some striking patterns emerge even from this first cut at the data. For starters, as Katz and Krueger write: "A striking implication of these estimates is that all of the net employment growth in the U.S. economy from 2005 to 2015 appears to have occurred in alternative work arrangements." This change toward alternative work arrangements is widespread across industries. It also seems to be occurring in roughly equal force across the income distribution, although the "alternative" workers at the low end of the income distribution are more likely to be categorized as temporary help agency jobs and on-call jobs, while the alternative workers at the high end of the income distribution are more likely to be categorized as independent consultants and freelancers. But more broadly, it appears that those who have been looking for jobs in the last decade or so, or who are looking now, are much more likely to find that the jobs on offer involve a fundamentally different set of employment relationships compared to the common jobs of the 20th century--much less likely to involve an ongoing relationship with an employer. 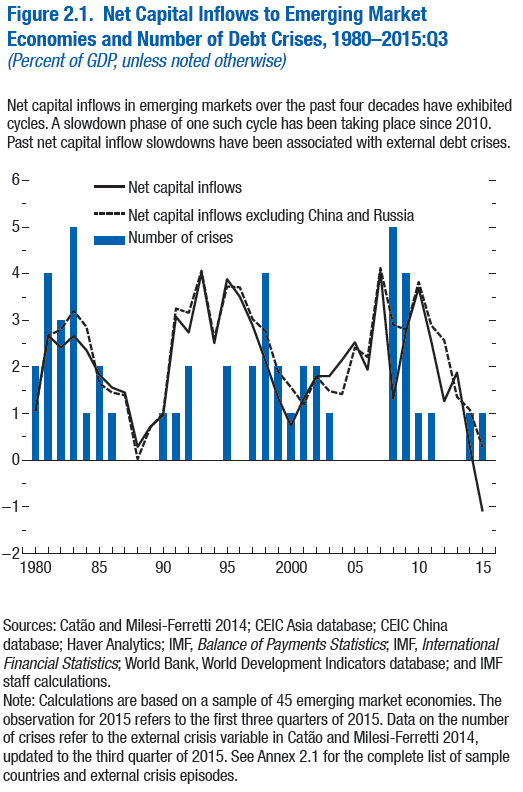 Global Capital Flows: Why No Crisis (So Far) This Time? Here's the puzzle. Outflows of international capital from emerging markets around the world played a key role in causing financial shocks and steep recessions all over the globe in the late 1990s, including the east Asian financial crisis affecting countries like Korea, Thailand, and Indonesia in 1997-98; Latin American countries like Brazil (1999) and Argentina (2001); along with an assortment of other places like Ukraine (1998) and Turkey (2000). But even larger outflows of international capital from emerging markets have been occurring in the last few years, with much less dire economic consequences. What changed? The World Economic Outlook published by the IMF in April 2016 devotes a chapter to this subject: "Chapter 2: Understanding the Slowdown in Capital Flows to Emerging Markets." What changed? In the late 1990s, the destructive economic dynamic sometimes evolved like this. Banks and large companies in a country like Thailand would borrow in US dollars. They would convert those US dollars to the local currency--say, Thai baht--and then lend and spend that currency in Thailand. This process of borrowing in US dollars and lending in Thai baht seemed fairly safek because government policy had been to keep exchange rates fixed (or close to it) over time. But when international capital inflows went into reverse, exchange rates declined. As a result, the big banks and companies that had borrowed in US dollars and loaned in Thai baht could not repay those US dollar loans. The government had often in some way guaranteed the stability of the banking system, but didn't hold much in the way of US dollar reserves, so the government finances ended up in trouble, too. A rising share of the original international capital inflows aren't in the form of borrowed money and debt, but instead are in the form of stock market investments or foreign direct investment. These other kinds of investments are more flexible: an inability to repay debt causes legal consequences and even bankruptcy, but a drop in the price of stock market investments means only a loss in asset values. Many of the big players emerging markets no longer need to borrow almost exclusively in US dollars; instead, they can now do a lot of borrowing in their own currency. As a result, they aren't exposed to the risk of exchange rate shifts. Here's a figure showing the rising ability of government and nongovernment borrowers in emerging markets to borrow in their own currency. Many of the key emerging market no longer fix their exchange rate. What used to happen back in the 1980s and 1990s was that governments would claim to have a fixed exchange rate, which actually was a situation where the exchange rate was fixed for a time and then took a huge jump. Ongoing exchange rate adjustments mean that the players in the global economy are more likely to take the risks of exchange rate shifts into account, and the adjustments can be more gradual. Many of the key emerging markets have built up substantial US dollar foreign reserves. Thus, if there is a sharp decline in capital inflows or an actual outflow, they can soften the effect of this change--at least for a time--by drawing down these foreign reserves. The IMF report mentions some other factors, as well. But the central point is a bit of good news for the global economy: As emerging market economies are playing a larger role in global economic output, they are also becoming more integrated into the global financial system in more flexible ways. As a result, the cycles of inflows and outflows of international capital that caused severe disruptions and financial crises back in the 1980s and 1990s have had less power to do so in the last five years. It's common to hear proposals that the US should adopt a "cap-and-trade" system for reducing climate emissions. Indeed, back in 2009 the House of Representatives passed the American Clean Energy and Security Act, the so-called "Waxman-Markey" act, which would have implemented such a law, but the legislation died in the US Senate without ever being brought to a vote. In the meantime, the European Union has now had a cap-and-trade policy in place for 10 years. How well is it working? The Winter 2016 issue of the Review of Environmental Economics and Policy has a three-paper symposium on the subject of "The EU Emissions Trading System: Research Findings and Needs." The EU ETS is a classic cap-and-trade system. As of 2014, the EU ETS covered approximately 13,500 stationary installations in the electric utility andmajor industrial sectors and all domestic airline emissions in the EU’s twenty-eight member states, plus three members of the closely associated European Economic Area: Norway, Iceland, and Liechtenstein. Approximately two billion tons of carbon dioxide (CO2) and some other greenhouse gases (GHGs) are included in the system, together accounting for about 4 percent of global GHG emissions in 2014. Aside from its sheer size in terms of geographic scope, number of included sources, and value of allowances, another distinguishing feature of the EU ETS is its implementation through a multinational framework, namely the EU, rather than through the action of a single state or national government, as assumed in most theory and as has been the case for most other cap-and-trade systems. They discuss a variety of the nuts-and-bolts details of the system. For example, should the permits to emit carbon be given to existing firms, or auctioned? Economic theory tends to favor auctioning, but the horse-trading of politics tends to favor giving the permits away, which is mainly what happened. How will the total carbon emissions over time be set? Will EU emitters be allowed to pay for steps that would reduce carbon emissions elsewhere in the world, and then use reductions to offset part of any required reduction in their own direct carbon emissions? I won't try to describe the ins-and-outs of the EU system in this blog post. It's gone through three "phases" and a bunch of other rule changes during its single decade of existence. But two graphs give a sense of its main themes--and the difficulties in evaluating it performance. 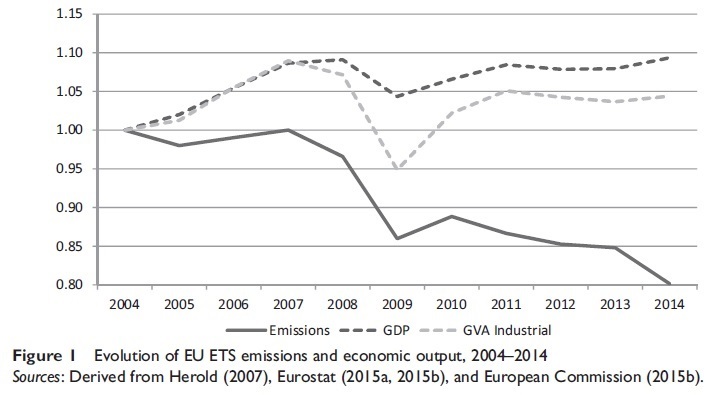 The first graph shows carbon emissions in the EU while the carbon trading system has been in effect. Emissions are clearly down. However, it's not easy to separate out the effects of the emissions trading system from other policies that would have an effect of reduce carbon emissions, including other environmental regulations and taxes, efforts at energy conservation, subsidies for non-carbon forms of energy, and the like. 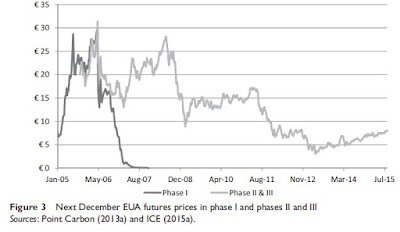 In fact, a look at the price of carbon in the ETS suggests that it might not be having much of a role. Notice that the price of allowances during "phase I" of the system fell all the way to zero: in other words, the allowed emissions of carbon were considerably above what was actually being emitted, so there was no additional cost for emitting. During phases II and III, the cost of emitting carbon has been at around €5 per ton of emissions, which is a lot lower than the price of about €30 per ton that is often recommended for making a realistic and useful dent in carbon emissions over time. To be blunt about it, the price data suggests that perhaps the EU ETS hasn't had much effect in reducing emissions, and may not have much effect looking forward. suggesting that emissions have exceeded the cap, or that they will do so, current prices do not seem likely to lead to the kind of technological transformation that would greatly reduce Europe’s reliance on fossil fuels. As is currently being discussed in the EU, the low allowance price could be counteracted through the use of new mechanisms such as price floors or strategic allowance reserves. However, a more direct (and environmentally beneficial) approach would be to tighten the cap, for example, by adjusting the rate at which it is decreased after 2020; because of banking, this should affect the price even today. We would argue that the fact that allowance prices turned out to be lower than anticipated (and thus EU climate policy was cheaper than expected) should actually be interpreted as good news rather than a problem. After all, the main economic argument in favor of an emission allowance market is that it delivers a particular emissions goal at least cost. Martin, Muûls, and Wagner focus on the specific sectors--energy and industry--that were directly regulated by the cap-and-trade arrangements under the ETS. 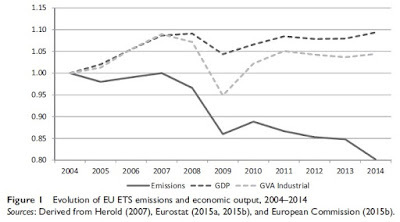 They argue that there is little evidence the emissions trading system hurt these industries, and some evidence that it did accelerate their reduction in emissions and stimulate their innovation in cleaner-energy alternatives. 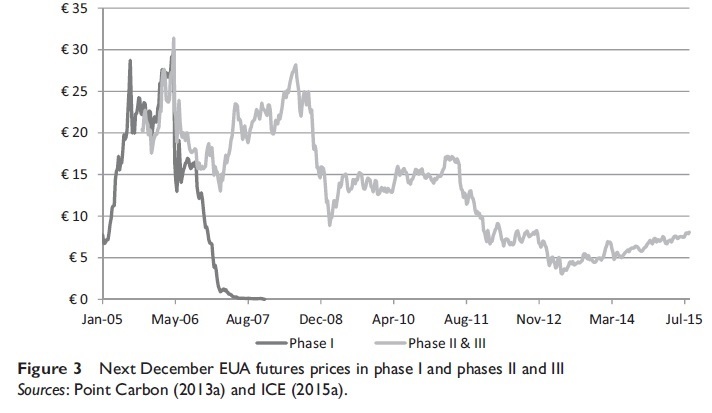 Absent a decision by the EU to abandon the program, which would require a super-majority, the EU ETS will march on with a continually declining cap, which, under all likely scenarios, will create continuing scarcity, thus virtually guaranteeing that a carbon price will be a permanent feature of the European economic landscape. Right now, the political pressures to change the rules in such a way as to allow a lower carbon price are quite muted. It will be interesting to see how the political pressures play out a few years down the road when the carbon constraint in the ETS start to push the price of the allowances higher, up to €30 per ton or perhaps considerably more.